Now that we have had time to let our victory sink in, and allow the busy holiday season to pass…it’s time to celebrate again! 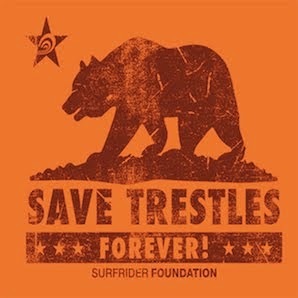 The Surfrider Foundation South Orange County Chapter is hosting a Trestles victory party on Friday, February 6, 2009, to celebrate the Federal government denying the proposed toll road through San Onofre State Beach. The party is being held on February 6th to mark the one year anniversary of our most gratifying victory when the California Coastal Commission voted to strike down the toll road. Come help us celebrate two victories in one night! What: Celebration! Doors at 8:30. Entertainment includes: Micah Wolf, Sli Dawg, Blues Offenders, The Jive Kings and some very special surprise guests! Please note: First come, first served. We need to respect the fire code, so if we reach capacity, you might have to wait for others to leave before you can enter. Surfrider and our coalition partners will continue to monitor any/all efforts by the TCA and we will keep you informed as we go along. In the meantime, let’s celebrate! Hope to see you on Feb 6th!